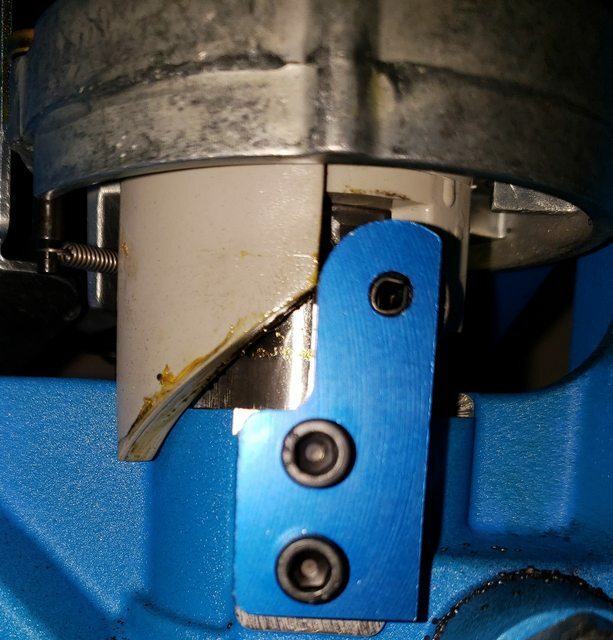 I've heard of others having issues with the bearing block as well and is why I haven't ordered one myself. • So what happens during loading is that the detent ball under the shellplate comes close enough to it's rest position, and spring pressure pops the shellplate forward the last 5 degrees of index movement. So the index roller does work, but it defeats all the anti-powder sloshing steps I previously took ! • The dimension from the center of the roller to the top mounting hole is 0.625". I calculate this needs to be extended by at least 0.200". If you have one of these by another maker, I surely would appreciate you measuring that vertical distance and the OD of the bearing for me. I like the idea, but I got to get one that reaches higher. Could you not ream out those slots/holes another .2"? Also I was wondering if you could tilt the unit so that the roller is more to the right and thus less contact with the angled indexing piece. Not really. The press frame and actuators have Left-Right key-ways to make the timing adjustment stay where you place it. So it's not simply the screw holes that are slotted. All those features working together preclude even tilting the actuator. I made my living as an engineer in machine design, so I can feel a design project coming on. Who knows? Maybe I can corner the market on properly designed roller actuators for the XL650 !! There's got to be at least $3 there for me. I have the roller from snowshoes on ebay. I'll look when I get home but I don't remember having this issue. Here is the one from snowshoes. It goes straight up and down at the priming stage. The roller is the same diameter as the blue aluminum. Here is another vender I stumbled across. I have not tried there products and am not affiliated with them in any way. As for quick release on powder drops, I simply remove the entire die head and dump. Cheaper and works great. I am interested in stopping the pitching of primers on my reloading room floor. Sometimes I can get through a reload session without any primers on the floor and sometimes I have 5-10 per 200 rounds loaded. Usually deterred by making sure the chute cotter pin is not too tight (allowing chute "door" to move freely). Which of the 550 primer chutes works best? Which of the 550 primer chutes works best? Simply put, the higher they sit, the better they work. I think the Bob Chute works best simply because it appears to sit about 1/8" higher than the UniqueTek version. Obviously, either unit can be modified to work even better. ► Some mods should be done in addition to the chute. One is to replace the "flapper chute" cotter pin on the bottom of the ram using some sort of round wire. Round wire seems to make the flapper rotate easier. People have used small nails, gem clips, safety pins, safety wire... all sorts of fixes. The other is to add weight to the top of the flapper while you have it off replacing the pivot pin. More weight makes the flapper open more reliably. People usually glue small hex nuts to the flapper. Small magnets work well and allow you to experiment with exact placement. Bobs Chute looks good. Thanks for link to 550 fixes. I am going to try small paper clip with small magnets. What worked best for me was to take a paper clip and bend it into a [_] shape. You spread the jaws just wide enough to allow each of the 2 ends to form the pivot, leaving the "body" of the C on the exterior of the ram. This is much harder to do, but the reason it works is that when the wire goes across the internal part of the chute, it tends to trip up the primer and make it do weird things. Those are the primers that tend to misbehave. So not having the pivot traverse the chute eliminates this small issue. I think I can make that paper clip shape happen with some needle nose and trial n error. ► I got the Primer Switch from Snowshooze today for my 650 and that is one slick item. Thanks so much for pointing that one out. ► On another note, I never could get the EntirelyCrimson shellplate advance roller to work perfectly on my machine. There are several versions of the 650 and it might be that by trying to fit all models with a single product, they can't make it behave on the latest model machines. If someone wants to try it, then drop me a PM. ► However, I am loving the powder measure quick disconnect from EntirelyCrimson. ► I also got the UFO lighting kit from KMS Squared and that is 10X better than the one that drops into the center of the Tool Holder. Since they don't occupy similar places I can run them both. The UFO is so much better, so much brighter that I decided to buy one for my son's LNL AP for his birthday.